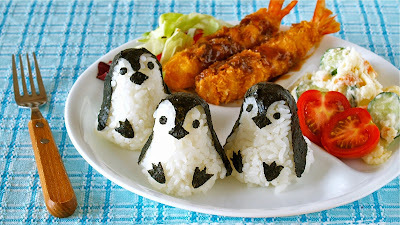 You can make the most cutest baby penguin-shaped rice balls using this Mold Set!!! I think it is available overseas, too. When I first found this Baby Penguin Onigiri Mold Set, I bought it immediately because it was so cute!!! 1. Wet and set the lower mold in the scooper. Put some rice in the mold and place the upper mold. Press the upper and lower molds tightly to form a penguin-shaped rice ball, then remove the rice ball. 2. Cut penguin body parts with Nori seaweed sheet cutters (press until Nori doesn't make tearing sounds). 3. Attach the cut out Nori pieces on the rice ball.